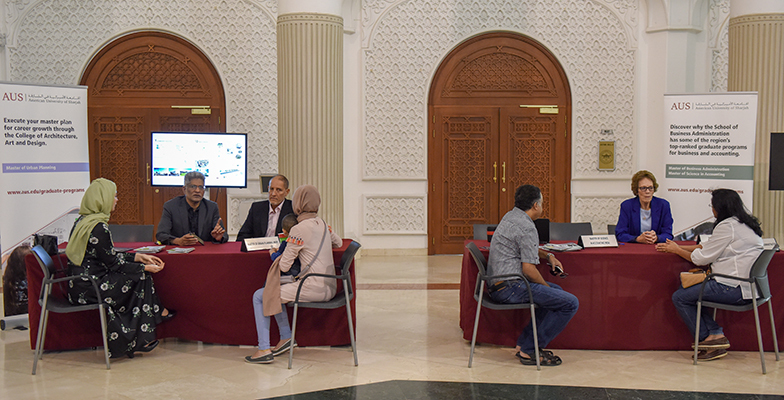 Scores of interested applicants attended the Graduate Open Day 2019 recently held at American University of Sharjah (AUS). The event, which was organized to provide visitors with an opportunity to explore the 14 master’s degrees and a PhD offered at AUS, elicited great interest from prospective students. Visitors met with both the university’s world-class faculty members and students to receive first-hand knowledge about the many programs and courses on offer, as well as learn about flexible learning options and financial aid available for qualified students. The visitors also learned about the university’s Executive and Professional Education which provides custom and open enrollment programs to help individuals realize their career goals. "We are very pleased to see a continuous interest in graduate studies in both STEM and non-STEM related programs, demonstrating the excellent reputation of AUS graduate programs as well as the diversity of program offerings that cater for industrial and societal needs. In particular, the newly introduced PhD in Engineering Systems Management program received great interest from the participants indicating the demand for professionals with doctoral degree." Spanning fields as diverse as engineering, urban planning, teaching English as a second language, mathematics, translation, business and accounting, AUS has an extensive range of graduate programs. The university has made an effort to offer graduate degrees in areas most in-demand among the region’s professionals, and which have the greatest impact on the region’s future economic and social prosperity.